Happy Sunday, today is a special Sunday. It marks the third year in a row I am participating in the Race For Life. Here is our Just Giving page just I case you have extra pennies to spare. I thought in honor Of the Race for Life I would show my favourite work out gear. I feel that you have to get the right pair of shoes for the perfect workout. They have to feel comfortable and for you right. I have two pair of shoes. 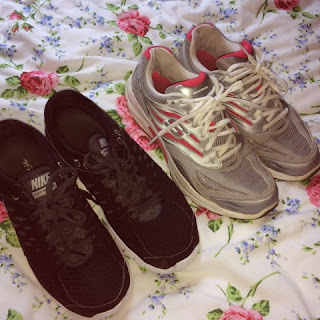 The second pair I Have are Nike Free Run, I bought these last year, again for walking but for more light walking. And for the gym.I fell in love with the style and the colour and they are my go to shoe. They are ideal for comfort and durability!! Sport Bras are essential for making your workout or exercising comfortable. The second is more expensive but super high quality. It is from Nike and it is for light support. I use this if I am doing home exercising or walking. It is super comfy and I love the colour. 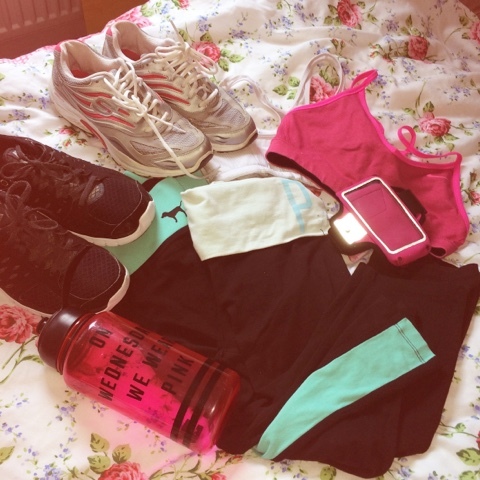 Nike have amazing workout gear so I would definitely have a browse in Nike. 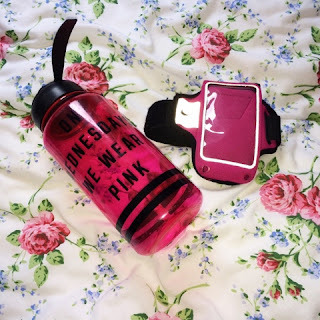 Both are from Victoria Secret Pink. VS is one of my fav shops , as you can tell I am so excited to be able to shop myself whilst I am America. If you haven't tried Yoga pants then you are missing out. They are thee comfiest things ever. One has a fold over waist band the other doesn't but to be honest it doesn't make a difference. I wear these in the gym or lounging about, anywhere really. iPhone/IPod Holder. I always find this really helpful. Whether you are on a run, cycling or on a bike it is much easier to listen to music whist having one of these. It means you don't have to hold it and you can let you hands/arms free. I was given this as a Christmas present from my parents last year and it just so happens to match my Nike sports Bra! WIN!!! Without motivation you will get nowhere. You have to think positively and start somewhere. I can say since my job has became a lot busier with different hours going to the gym has been very difficult but with a set home workout it can be much better for you. Let me know, if you want anything fitness health related. Hope you are having a wonderful day!! I'll be having a nap but this time so enjoy your day!! !